Partly cloudy with afternoon showers or thunderstorms. High 72F. Winds S at 10 to 20 mph. Chance of rain 60%..
Thunderstorms this evening followed by occasional showers overnight. Low 46F. SSW winds shifting to NW at 10 to 15 mph. Chance of rain 90%. When considering a potential business contract give some thought to what happens if things go wrong with the deal. Agricultural producers are often asked to enter into written contracts. Those contracts can cover a wide range of issues including buying equipment, leasing property and selling products. 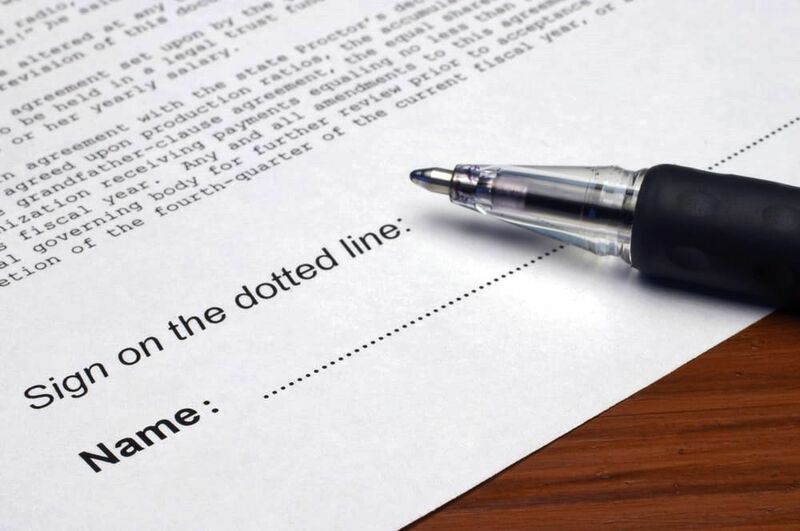 Although the subject matter varies widely, there are a number of issues that will typically apply to any business contract no matter what the subject matter. This article will summarize some important items to keep in mind when entering into a business contract. The first step in considering any business contract is to think carefully about the parties – those who are actually entering into the agreement. Many producers conduct business through a corporation or other form of business entity. When entering into any business contract one should make clear that the business entity is entering into the agreement, and not the producer in his or her individual capacity. Also think carefully about the counter-party to the agreement. Consider the reputation of that party. Consider doing a credit check if relevant. A party’s creditworthiness may affect its ability to pay amounts owed as well as perform its non-monetary obligations under the contract. A large number of contractual disputes relate to what services were to be performed or goods were to be delivered. A well-drafted business contract will describe the goods being sold or services being provided in as clear and accurate a manner as possible in order to avoid the risk of future disputes. All important issues and assumptions should be confirmed in the written contract. It’s best not to rely on oral assurances or “agreements to agree” at a future date. The economic terms are obviously one of the most important sections of any business contract. A good contract will clearly define how the price is determined – for example, a fixed or variable sum. When reviewing contracts for the sale or purchase of goods, review the delivery terms carefully. Consider whether delivery costs are included in the price. The contract should clearly outline how payment is to be made – for example check or wire transfer — and when it’s due. Also consider whether the payment terms will or should include concepts such as installment payments or retention of payments to be held as security for future performance by the counter-party. Many contracts incorporate some form of contingency into their terms. A good example is making an offer to purchase a new home contingent on the sale of an existing home. If a contract includes contingencies – sometimes called “conditions precedent” – be sure that, to the extent possible, the outcome can be controlled and the conditions satisfied so both parties are obligated to perform under the terms of the contract. At the onset of any business relationship most business people assume that everything will end well. Unfortunately business deals do not always go as planned. Any lawyer will say it’s far more effective and cheaper to address issues at the front end in a clearly written contract, than to address them in a dispute-resolution process after things have gone wrong. So when considering a potential business contract give some thought to what happens if things go wrong with the deal. Consider what if any financial loss could be incurred. The “fine print” of many contracts can contain limitations of liability that may not be appropriate in all circumstances. The effective date of an agreement can sometimes be very important, as can the other “term-related” provisions. Consider if it’s a contract that will last for a particular period of time – a “term.” Consider if it’s a contract that calls for a one-time delivery of specific goods or services. A clear timetable is essential for any business contract. Some contracts include provisions restricting one of the parties from competing with the other. Those provisions are sometimes called “restrictive covenants.” Those provisions are technical and can be subject to limitations under state and federal law. Despite those legal impediments, parties can sometimes inadvertently enter into agreements that negatively affect their ability to do business with other parties in the future. Be careful when considering those types of arrangements. An important aspect of the “what happens if things go wrong” analysis is to consider how each party can pull out of the contract. If, for example, the counter-party fails to perform, a producer needs to consider if he or she is able to cancel the contract without demonstrating “cause.” Cause can be difficult to prove. That kind of termination right can be extremely important in making sure that one is not unreasonably tied to a problematic counter-party who is not performing. Failure to consider key issues and avoid common pitfalls during contract negotiations may result in unforeseen obligations, unintended breaches or negative financial consequences under a contract. Keep the above issues in mind to help avoid negative outcomes. Matthew Rowe is an attorney with Ruder Ware. With roots in central and west-central Wisconsin, the law firm of Ruder Ware provides services tailored to the agricultural industry. For nearly 100 years, its attorneys have counseled farmers and other agribusinesses on succession planning, business issues, employment law and litigation. Visit www.ruderware.com or call 800-477-8050 for more information.